This October, as part of the American Cancer Society’s 19th annual “Making Strides Against Breast Cancer,” I'm partnering with Dean’s Dairy, to share how you can help make strides, just by doing something you do already. For some, daily! All opinions are my own. I'm so incredibly thankful for my beautiful, healthy family and the blessing I have. I try to live in the moment, and not worry about the next. Still, there's always a piece of me living in fear. I'm a mom, I'm pretty sure that's how it goes. I don't even like saying the "C" word. Who does? Anyone who has been affected by cancer knows, it's not only the person with cancer battling the disease, the entire family is in the battle too. Senior director of corporate relations at the American Cancer Society. Thankfully, behind all of my worry, there are glimmers of hope shining through. I believe there is a cure. I know there's a cure. The advances being made in medicine today, are, in some cases, leaps and bounds from yesterday. That's why I give to the American Cancer Society, regularly. God forbid cancer ever strikes my family and friends, but if it does, I hope there's a cure. That's why it's so important to support all initiatives that fund cancer research. Just think, the five-cents donated on your behalf for buying a specially marked pink ribbon product in October, may just save millions of lives. Seriously. It all adds up. Here's how easy it is to support breast cancer research during the month of October. You buy milk weekly, possibly more, right? 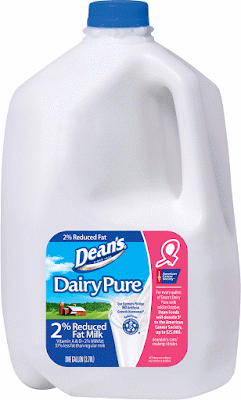 Beginning September 26, 2016, and continuing throughout October 31, 2016, for every specially-marked gallon of Dean’s DairyPure white milk sold in the Louisville area, Dean’s Dairy will donate five-cents to the American Cancer Society. NOTE: Products eligible for the five-cent donation will feature the pink ribbon and the American Cancer Society logo. Backed by an exclusive Five-Point Purity Promise®, DairyPure brand products contain no artificial growth hormones,** are tested for antibiotics, are continually quality tested to ensure purity, only come from cows fed a healthy diet and are cold-shipped from your trusted dairy. Imagine if every time you bought something a percentage went to fund research that WILL save lives? I know that certainly motivates me to buy that brand. Kudos to, Dean's Dairy, for keeping families healthy and giving money to a cause that may save their life one day. 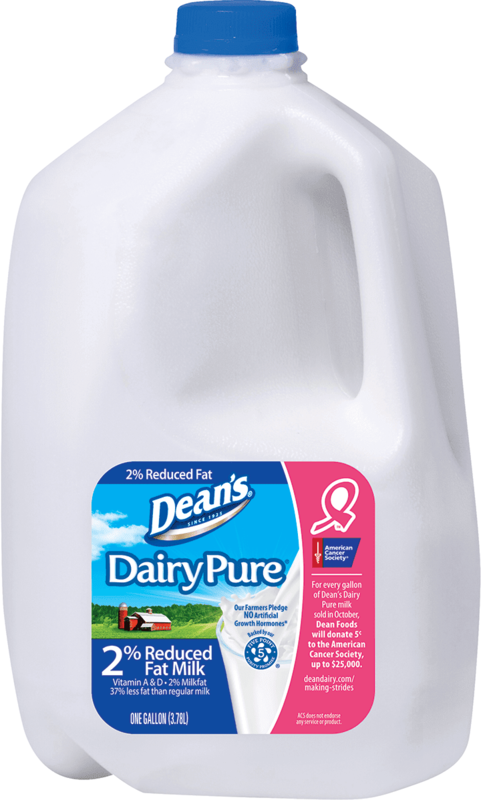 Next time you buy milk, look for the pink ribbon on specially marked gallons of Dean's DairyPure Milk. Know that you're not only taking care of your family with locally sourced wholesome milk, you're taking care of their future, too. Don't wait until it happens to you to want a cure, want it NOW! Support the cause now. For more information about Dean’s Dairy, visit DeanDairy.com and find Dean’s Dairy on Facebook. To learn more about the American Cancer Society and the upcoming “Making Strides Against Breast Cancer” events in Kentucky, please visit MakingStridesWalk.org. NOTE: If Dean's DairyPure Milk is not available in your area, don't go away just yet, the Dean's Dairy website is PACKED with recipes for southern comfort food and healthy treats kids will love! Check out the recipes, here.